bereit, und auch wenn ich selbst dieser Mensch war. in diesem Augenblick, wo ALLES stattfindet, so lebe ich heute jeden Tag, Tag für Tag, und nenne es BEWUSSTHEIT. mit meinem Herzen verband, bekam der Verstand einen wertvollen Verbündeten. In diesem Event erfahren Sie, wie Sie diese Freiheiten in ihrem Leben umsetzen und leben können. Was geschieht, wenn wir uns mal nicht „hinten anstellen“, mit unseren inneren Bedürfnisse und Gefühlen oder anders gesagt .... "mal beginnen, uns selbst zu lieben". Wie gelingt es – ohne dabei egoistisch oder mit anderen in Konflikt zu sein – freier zu sein und zu fühlen? ist systemischer Pädagoge und war über 20 Jahren Trainer für das Business Reframing Inst./ Karlsruhe im dt. Sprachraum (Ö,D,CH) tätig. Er ist Co-Autor der 6. Auflage von Business Reframing. Nach einem 2½ jährigen Besuch einer Clown-Schule (Tamala)nützt er die Erfahrungen gezielt auch für die mentale und psychische Gesundheitsförderung. Dafür wurde 2011 der "Verein für positive Lebensgefühle" ins Leben gerufen. As I began to love myself I found that anguish and emotional suffering are only warning signs that I was living against my own truth.Today, I know, this is "AUTHENTICITY". and I could see that everything that surrounded me was inviting me to grow. Today I call it "Maturity". and that make my heart cheer, and I do them in my own way and in my own rhythm. Today I call it "SIMPLICITY". As I began to love myself I freed myself of anything that is no good for my health - food, people, things, situations, and everything the drew me down and away from myself.At first I called this attitude a healthy egoism. Today I know it is "LOVE OF ONESELF". As I began to love myself I quit trying to always be right, and ever since I was wrong less of the time.Today I discovered that is "MODESTY". As I began to love myself I refused to go on living in the past and worry about the future. Now, I only live for the moment, where EVERYTHING is happening.Today I live each day, day by day, and I call it "FULFILLMENT". As I began to love myself I recognized that my mind can disturb me and it can make me sick.But As I connected it to my heart, my mind became a valuable ally. Today I call this connection "WISDOM OF THE HEART". We no longer need to fear arguments, confrontations or any kind of problems with ourselves or others. Even stars collide, and out of their crashing new worlds are born. Today I know THAT IS "LIFE"! 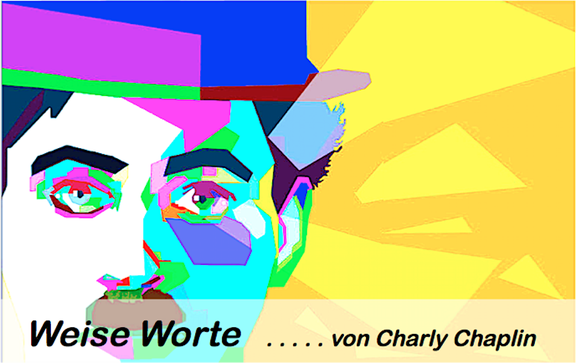 weiteres aus der Rubrik "Weise Worte"